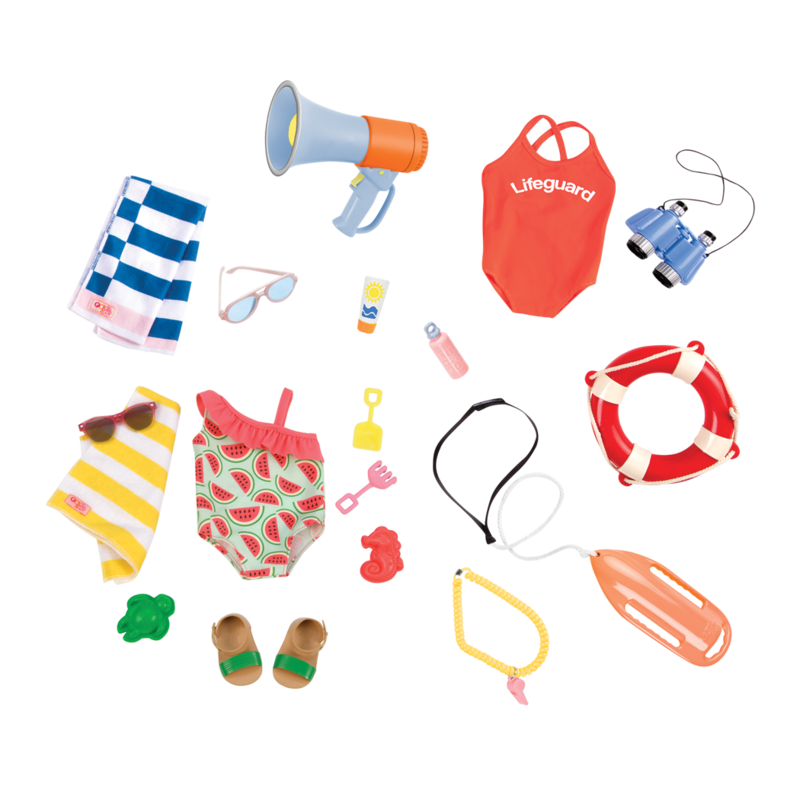 A super-fun bundle of beach accessories for 18-inch dolls! 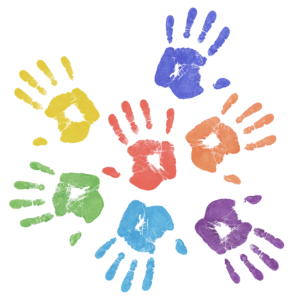 You’re making waves with the sun, sand, and stars! 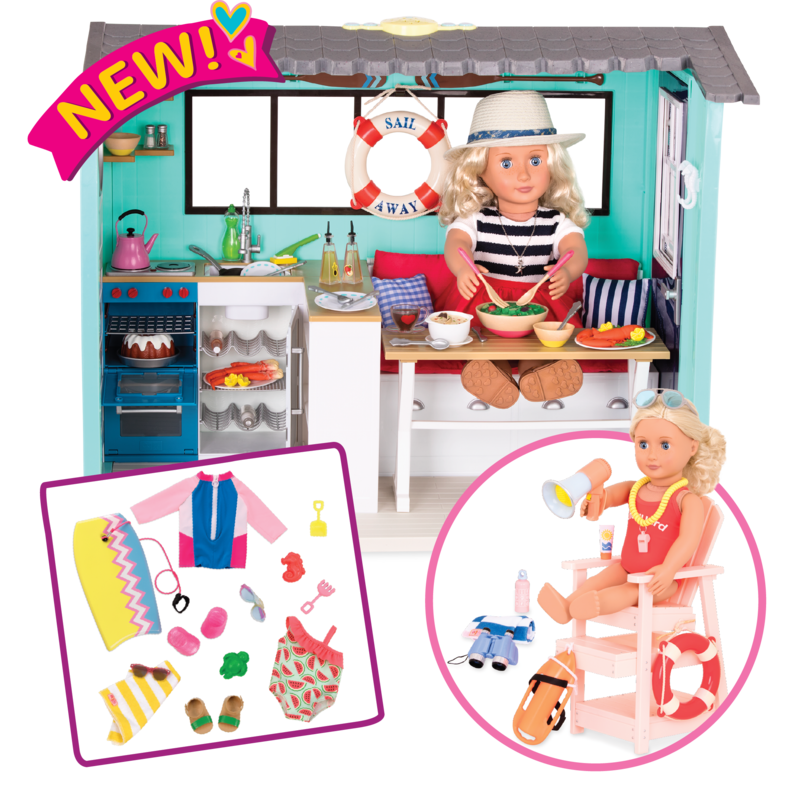 You’ll have oceans of fun with the Our Generation Seaside Beach House Set with Clarissa, an 88-piece bundle set for 18-inch dolls with everything you need to live life by the waves. 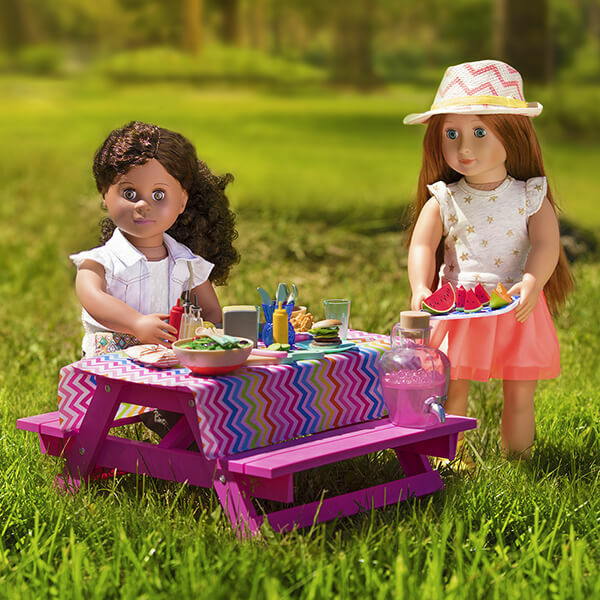 Fun Beach Accessories for 18-inch Dolls! 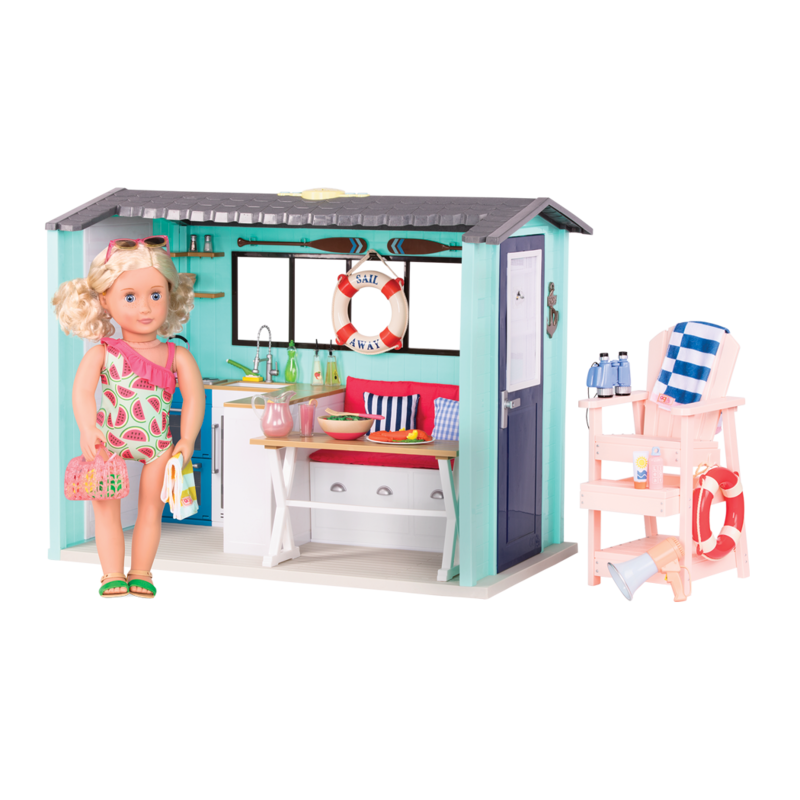 Whether up high on the lifeguard chair or tucked inside your cozy seaside cottage, this beach set will have you surfing on good vibes! 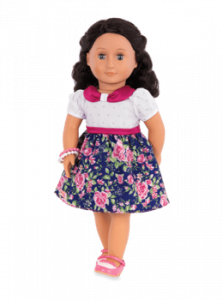 Meet Clarissa, a beautiful 18-inch doll with bright blue eyes, freckles, and medium-length, curly blonde hair. 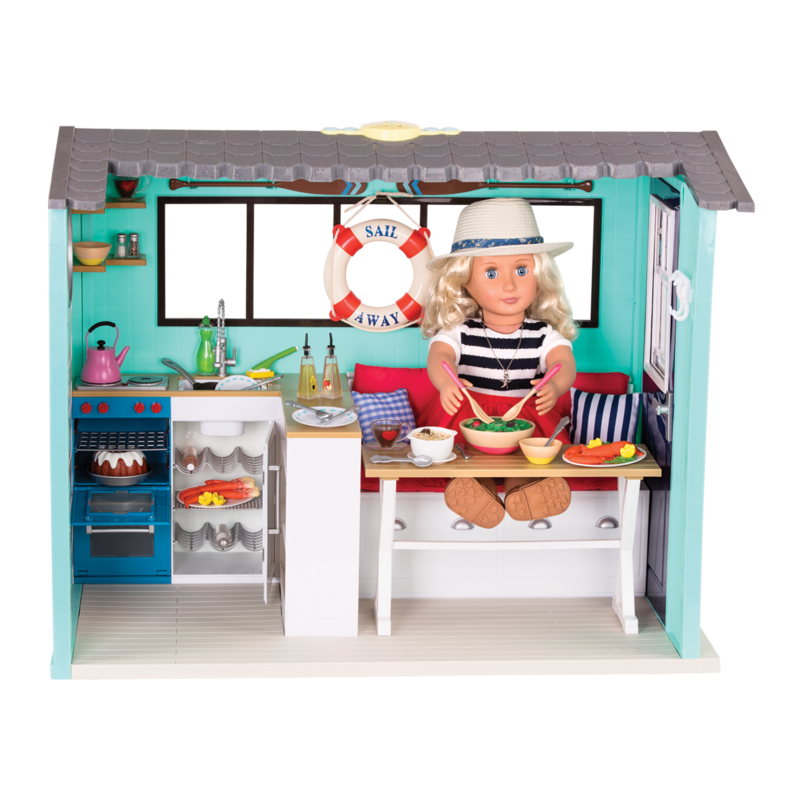 She loves staying at the Seaside Beach House, a happy hideaway by the sea with working kitchen and ocean sounds, realistic food and kitchen accessories, a dining bench that converts to a bed, and a beautiful starlight ceiling projector! 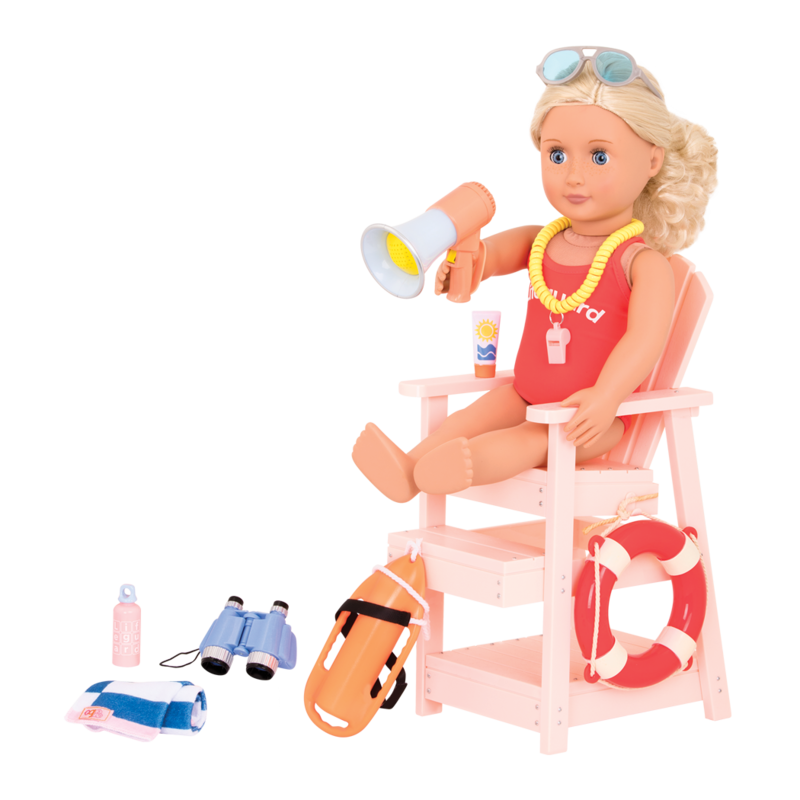 Keep the beach safe for your doll’s friends with the lifeguard chair, lifeguard bathing suit, megaphone (it really makes noise! 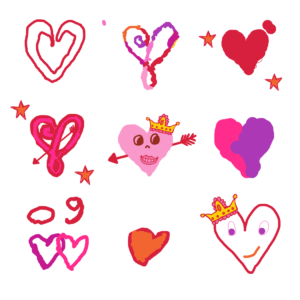 ), and mini binoculars. 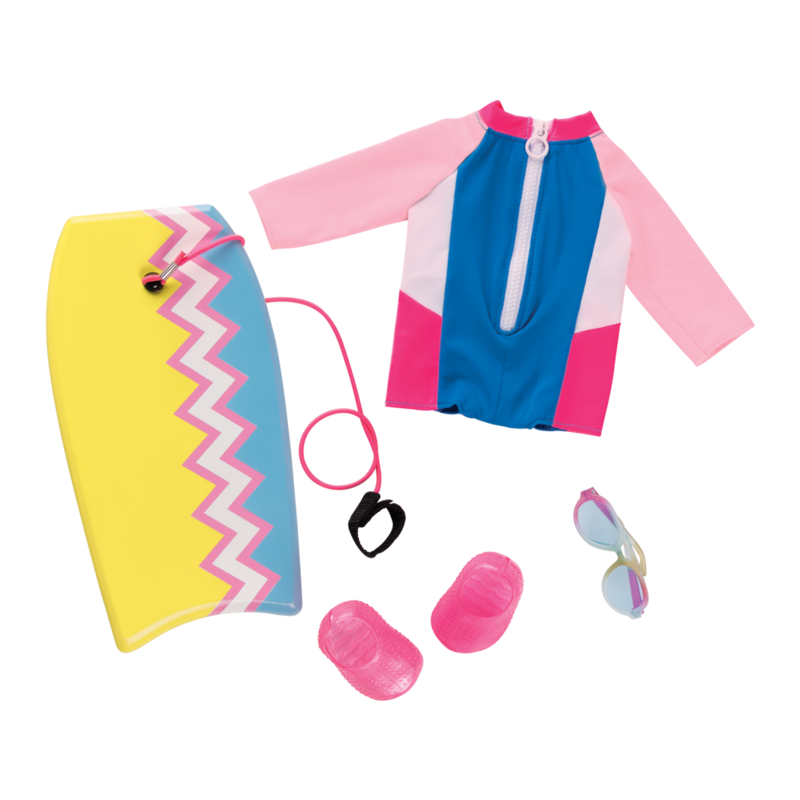 When it’s time to play or relax on the sand, choose the cute watermelon bathing suit and sand toys, or gear up with the boogie board and wetsuit. 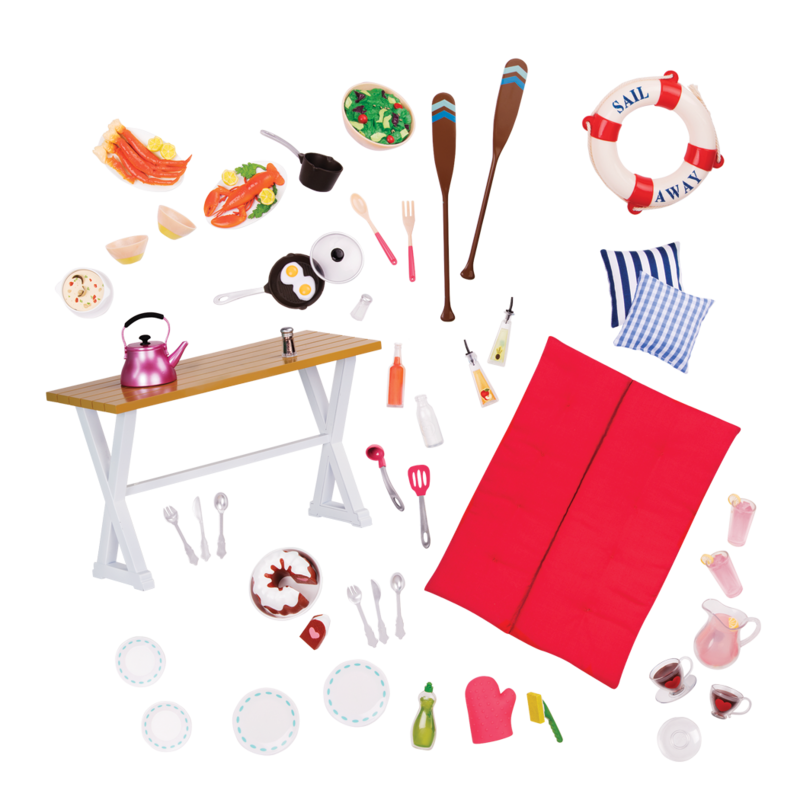 The Seaside Beach House Set has a total of 88 parts and accessories for hours of oceanside fun! 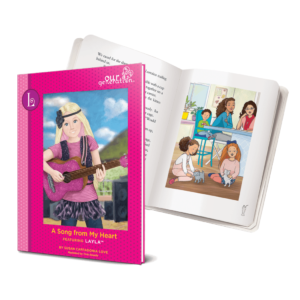 Have you met Coral and Dedra? 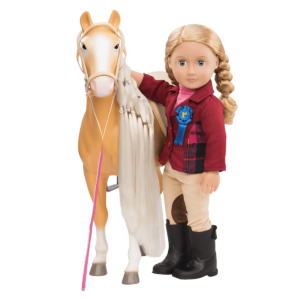 Coral is a brave 18-inch doll who has long curly blonde hair, freckles, and blue eyes. 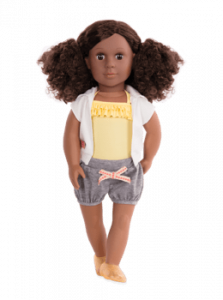 Dedra is a beautiful 18-inch doll with curly dark-brown hair and warm brown eyes. 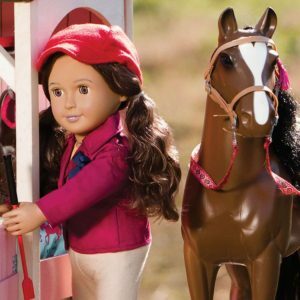 They love adventures at the beach! 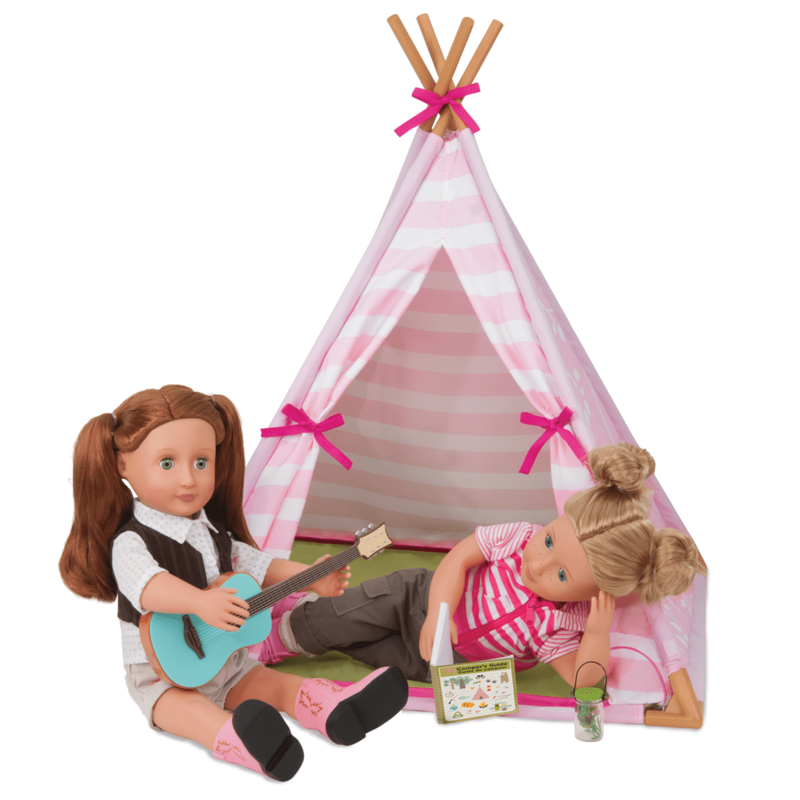 For extra accessories for a perfect day on the sand, set your dolls up with the Day at the Beach set, which includes a comfy beach chair and cool sand toys so your dolls can build a sand castle! 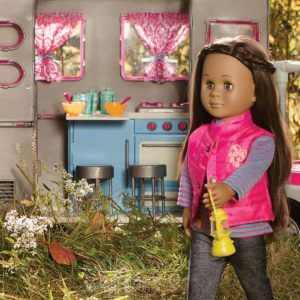 It’s important to remember that Our Generation dolls can get damaged if they are left in the sun or heat, and they don’t like real water (only pretend water). 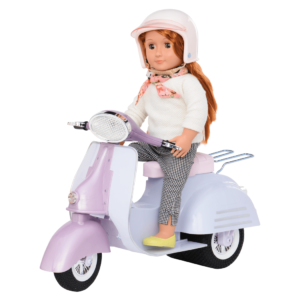 So please take good care of your doll and don’t put her in real sand or in real water. 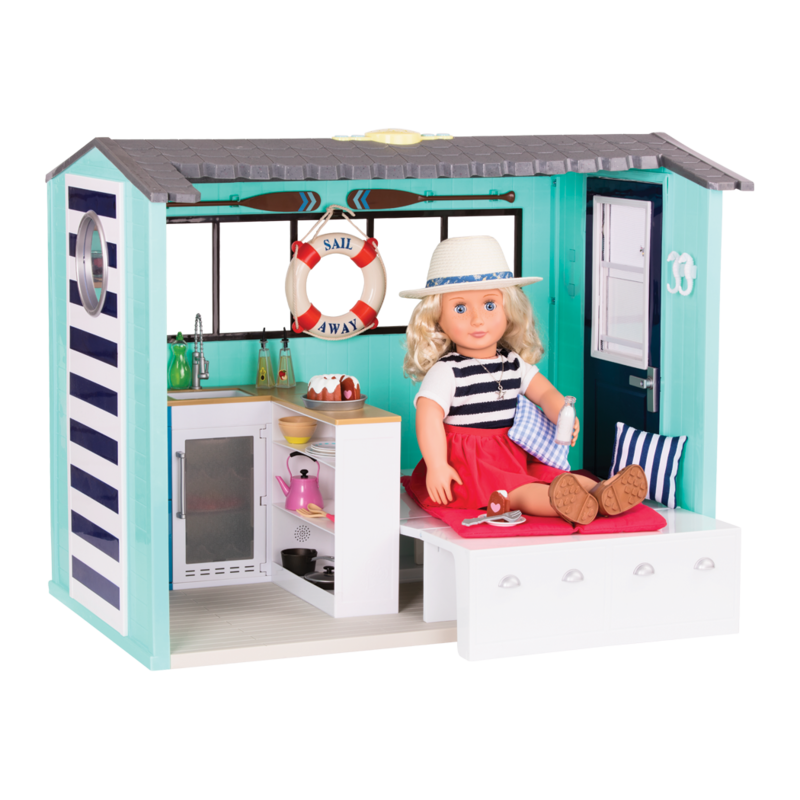 88-piece Complete Beach House Set for 18-inch dolls! 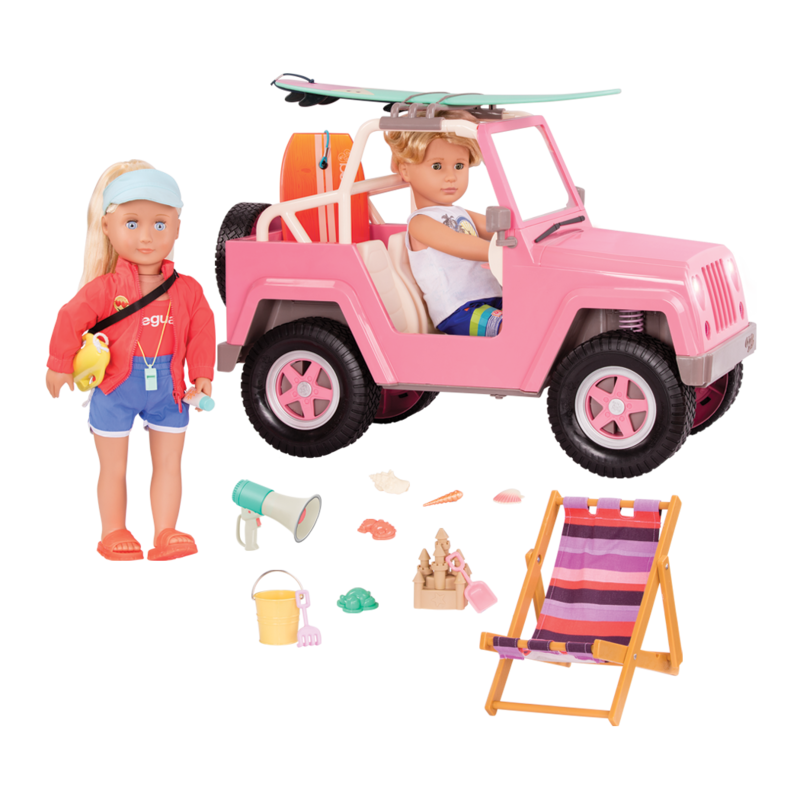 Includes doll, beach house, lifeguard chair, boogie board, 3 swimsuits, & more! 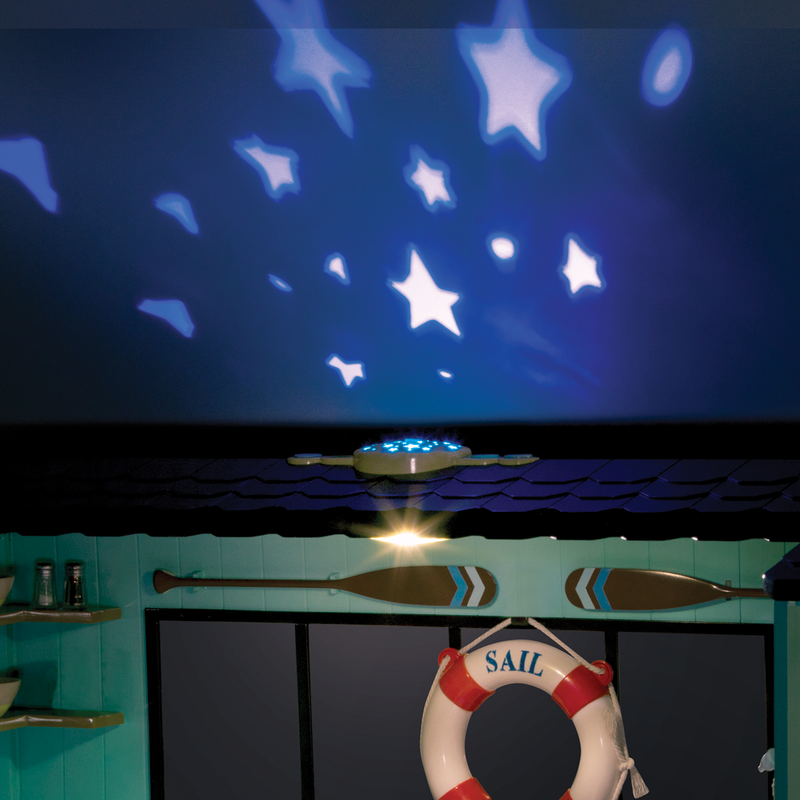 Beach House features fun lifelike sounds and star ceiling projector! Lifeguard megaphone really makes sounds! 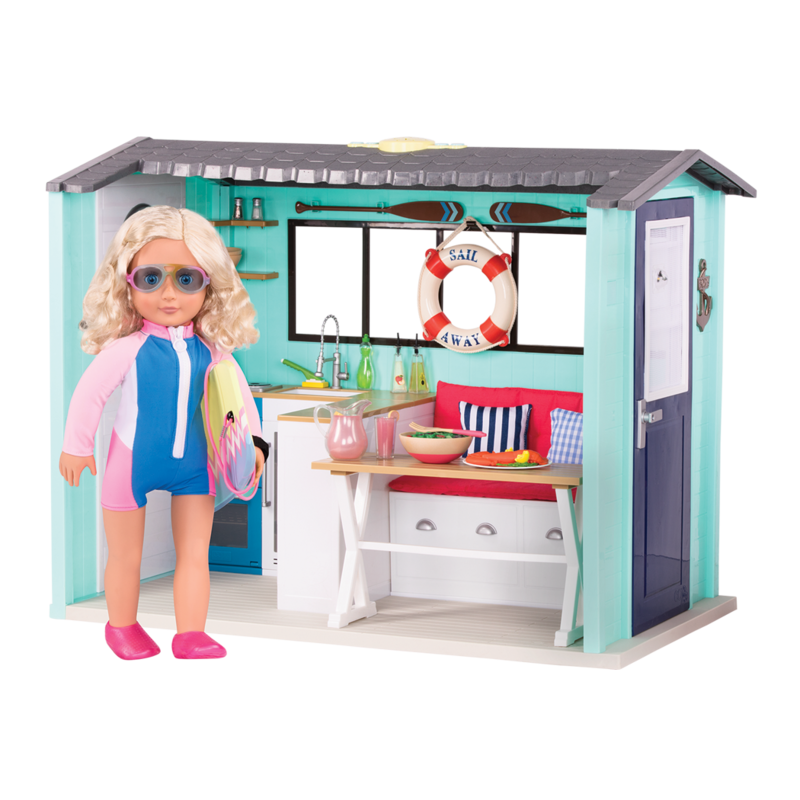 The Seaside Beach House arrives fully assembled, so you can have fun playing with it right away! 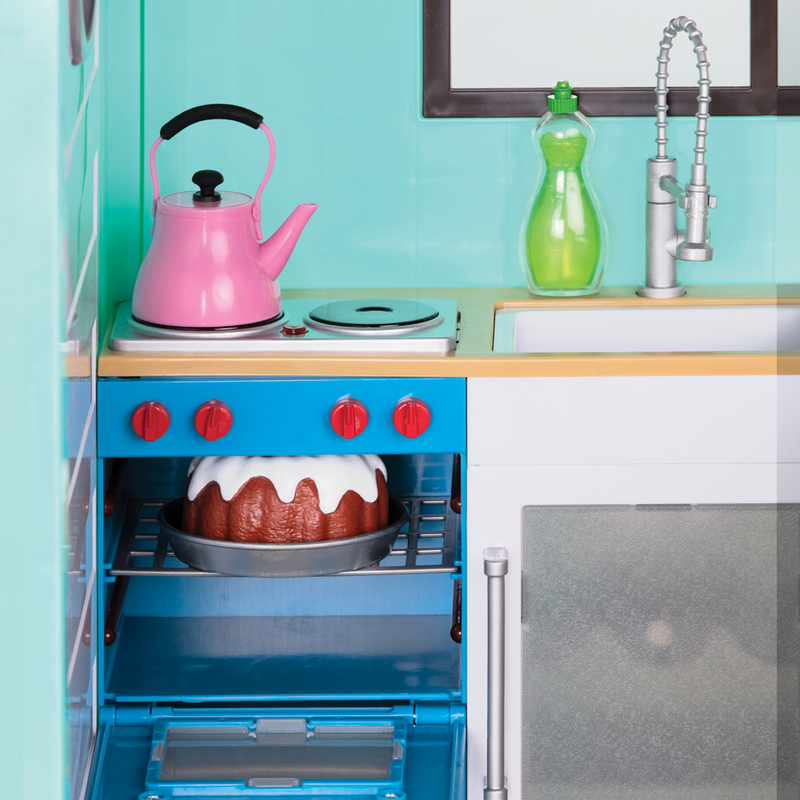 The first thing you will need to do is locate the power switch. 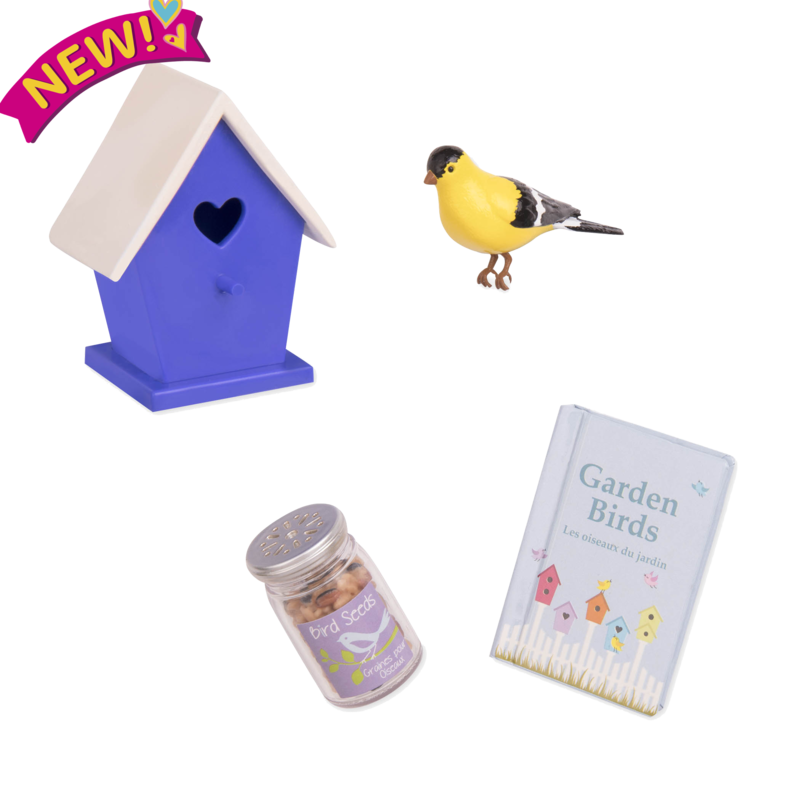 In this case, it is located on top of the fold-out bench, under the cushions. 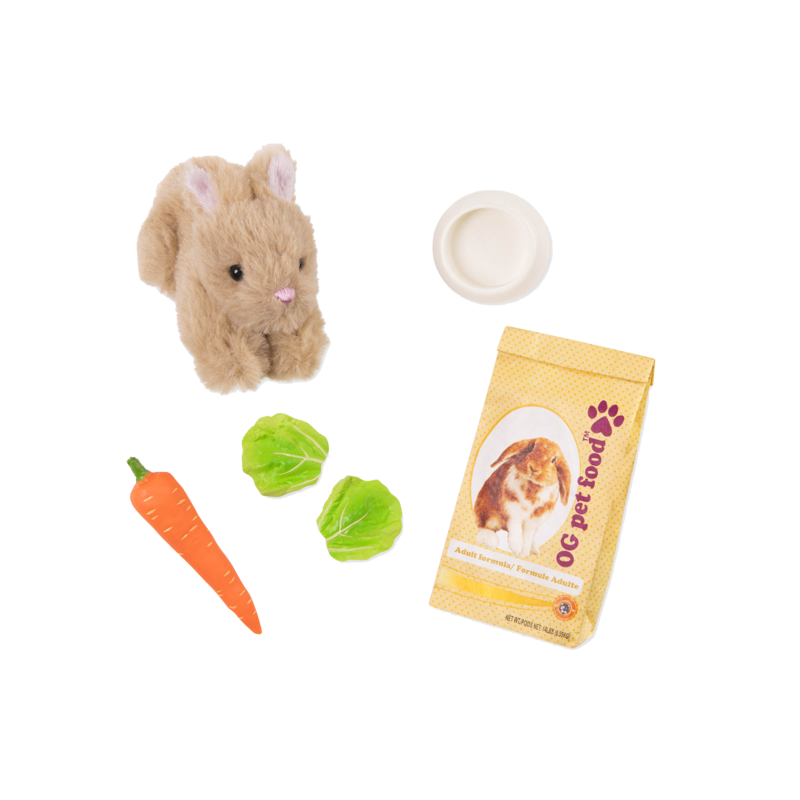 Larger accessories and toys with special features that require batteries have 3 settings – Play, OFF, and "Try Me. 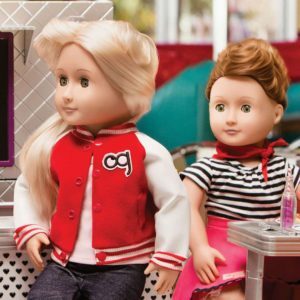 "Most toys will arrive with the "Try Me"setting activated, in order to let you test out the features in store while conserving battery life. 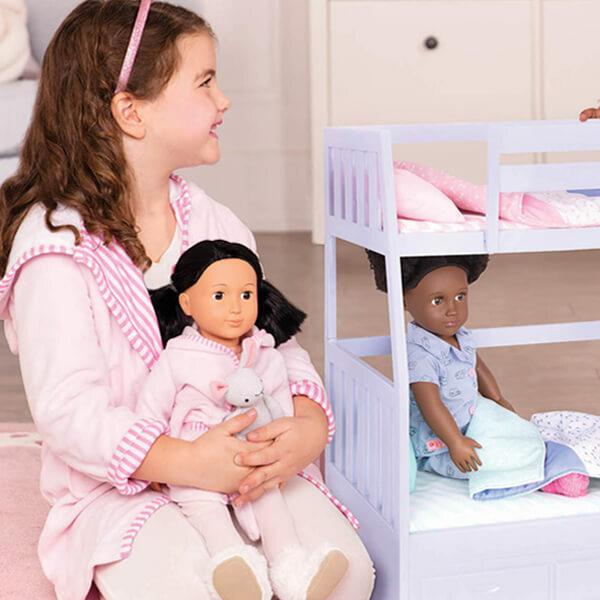 To start playing with your toy at home, please make sure the power switch is set to the "Play"position. 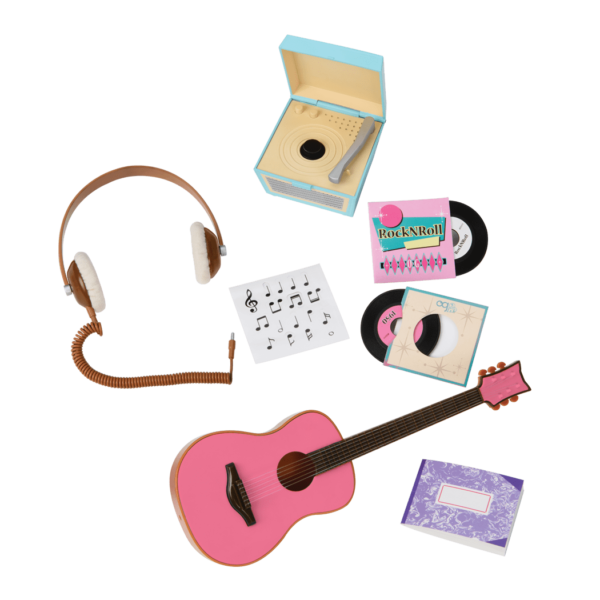 When you are finished playing, you can turn it to the "OFF"position to help preserve the batteries. 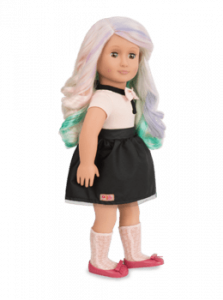 When playing with your dolls in the Seaside Beach House, it's important to remember that Our Generation dolls can get damaged if they are left in the sun or heat, and their favorite kind of beach is an imaginary beach! 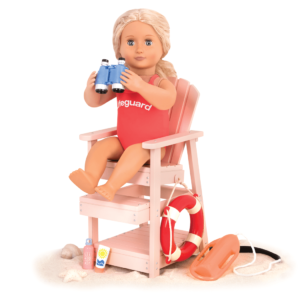 So please take good care of your doll and don't put her in real sand or in real water.